This Nov. 20, 2017, file photo shows a customer at a coffee bar in front of an Amazon pop-up store inside the Lakeview Whole Foods Market store in Chicago. 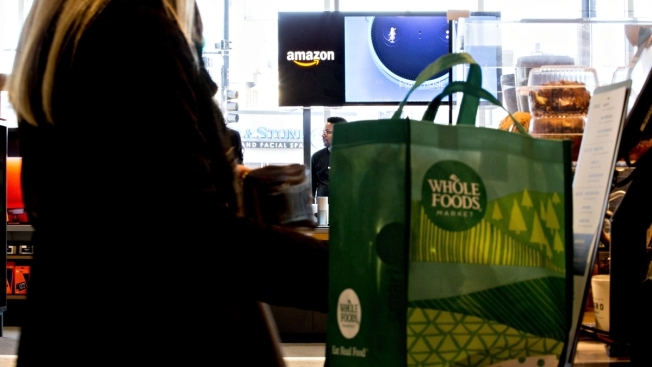 It's prime time for Whole Foods shoppers with Amazon Prime memberships. That's because, starting on Wednesday, June 27, Amazon Prime members who shop at any Whole Foods store throughout the US will get access to special weekly deals, plus an extra 10 percent off sale items that are tagged with a yellow sticker. The announcement was made just in time for Fourth of July party spreads, and some of this week's specials include big discounts on foods that would be great to stock up on for a cookout. For example, baby back pork ribs are half-off at $5 per pound, organic red cherries (perfect for cherry pie) are discounted to $4 per pound and organic yellow peaches (hello, peach cobbler) are half-off at $2 per pound. In mid-May, Amazon announced the first wave of Whole Foods locations where Amazon Prime members would get perks — a long-awaited benefit for shoppers since the June 2017 purchase of the organic grocery giant. The Prime member discounts began at 12 stores in Florida with a promise of becoming nationwide sometime this summer. As of right now, customers in only 23 states have had access to these deals.